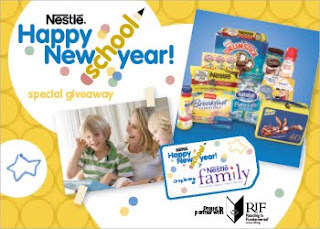 Enter our Nestle Back to School Giveaway! We love when Nestle teams up with us for a giveaway, so I was REALLY excited to be able to offer our readers another chance to win -- this time with a back to school theme! Before we get into the details, I have to tell you about the amazing thing that Nestle is doing by partnering with RIF (Reading is Fundamental). This organization helps kids in their journey to love books by giving them 3 essential elements: reading motivation, family and community involvement, and the excitement of choosing free books to keep! In fact, Nestle's support has already helped to distribute millions of books to Elementary Students through their Adopt-a-School program! Wanna Win? We have an amazing prize pack to give away to a lucky reader, including a $25 gift card to Walmart to help with school supplies, a NESQUIK® lunch box, product from RAISINETS® and a mix of free coupons from NESTLÉ® Pure Life, OVALTINE®, TOLL HOUSE® Refrigerated Cookie Dough, TOLL HOUSE Morsels, NESQUIK, COFFEE-MATE®, DRUMSTICKS® and CARNATION® BREAKFAST ESSENTIALS™. To be entered to win, simply comment on this post with your favorite product from Nestle! You have until September 12th at 11:59 pm CST to get your entries in, and you CAN ENTER EVERY DAY! (Just comment as directed for the first entry, and then enter with "today's entry" for each entry after that. You can also win even BIGGER prizes at Nestle's giveaway via their website. Their Happy New School Year Sweepstakes gives you a chance to win $5K in school supplies plus a $2K literacy grant for your school -- plus other prizes. You can enter daily at the Nestle family giveaway page until October 15th. *A similar prize pack was sent to me, and $50 in books was donated to the RIF school of my choice for participating in this promotion. My favorite Nestle product is Chocolate Nestle Toll House Morsels. I also love the Nestle Holiday Toll House Morsels in both red and green that come out in a month or two. Great for treats. I love the Chocolate Nestle Toll House Morsels! We love to make home made chocolate chip cookies! Nestle Toll House morsels for making some delicious fudge! Yummy! I love the Carnation Instant Breakfast, especially the Vanilla. Carnation Instant Breakfast i my favorite Nestle product! I like the NESTLÉ® Hot Cocoa Mix, it is so good during the fall and winter. I love them all but my favorite is RAISINETS® because its the best thing to eat at the movies! I love Toll House Chocolate Chips. We love Drumsticks at our house!! My fave product from Nestle is the chocolate drink mix. My favorite in Nestle Toll House Semi-Sweet Chocolate morsels. Nestle Drumsticks are my favorite. YUMMY!! My favorite Nestle product is Oh Henry candy bars. NESQUIK powder to make hot chocolate with. I like the TOLL HOUSE® Refrigerated Cookie Dough. Nestle Semi Sweet TollHouse Morsels. Nestle's Toll House Cookie Dough! I love making the cookies and eating them while they are still warm! Their chocolate chip cookie dough makes the best cookies! I love their Drumsticks! Thanks! They make so many things we love- I'll say the butterfinger candy bars are my fave. My favorite Nestle is Nestle's Quik chocolate milk powder. Thanks! I like Raisinets. I keep a box in my desk drawer for snacks. The Toll House morsels. We stock up at Costco's for Christmas baking pretty soon. My favorite product from Nestle are Coffee-mate products. My favorite Nestle product is the Chocolate Chip Cookie Dough. My favorite is the Nestle Semi-Sweet Chocolate Chips. I love the refrigerated tubs of chocolate chip cookie dough! I like Nestle hot chocolate mix. My favorite is Nestlé Milk Chocolate Cranberry Raisinets :) *Thanks* for the giveaway! I love Nestle Toll House refrigerated cookie dough. And I just remembered I have some in the fridge- now I know what I'm doing this afternoon! We love their Nestle Crunch Ice Cream Bars. I like the Carnation Instant Breakfast as it is quick and nutritious. My favorite product is Nestle Drum Sticks. My favorite Nestle product is Nestle Toll House Morsels. I love Juicy Juice. It isn't always utilized as a breakfast product but it is by far my favorite of their products. Today's entry- Happy Labor Day! I love the Nestle Tollhouse Morsels. Yum. :) Need to make cookies soon! Coffee Mate is my favorite-I use it every day! nestle toll house chocolate morsels I love. I like NESTLÉ®TOLL HOUSE® Morsels. Semi Sweet Chocolate Chips are my ultimate all time fave Nestle product. We love the Nestle Toll House Chocolate Chips in our house! Nestle toll house morsals are my favorite. They are great anytime of the year to make those wonderful smelling cookies that bring my kids home everytime. Hello? It has to be their NESTLÉ®TOLL HOUSE® Morsels. Really, I've used them so much I should have stock in the company. I like Nestle Crunch bars! i love all of their products...mmmm drumsticks!!! my favorite are the drumsticks! If I HAVE to pick just one, Nesquick. I live for my Coofeemate creamer..I always keep some in the fridge at home and at work! raisinets are my favorite for sure! My fave has to be tollhouse cookie dough. Definitely Nesquick. I can't ever get enough chocolate milk and neither can the kids.